This weekend was absolutely gorgeous! We did lots of fun things! 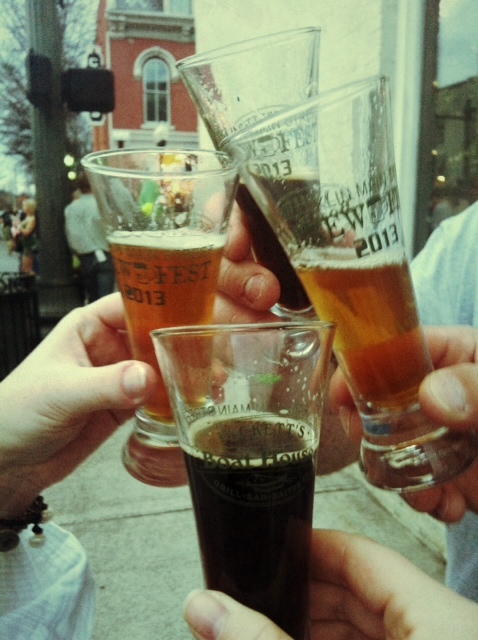 We went hiking, fired up the grill and attended the 10th Annual Main Street Brew Festival! It was great! I had heard mixed reviews about the festival but I give it two thumbs up. The check in (we bought our tickets on line) was easy, there was plenty of beer and the weather was great!! These were the tasting glasses. The whole weekend really got me in the mood for Spring. Too bad the weather is going to cool off again later this week. 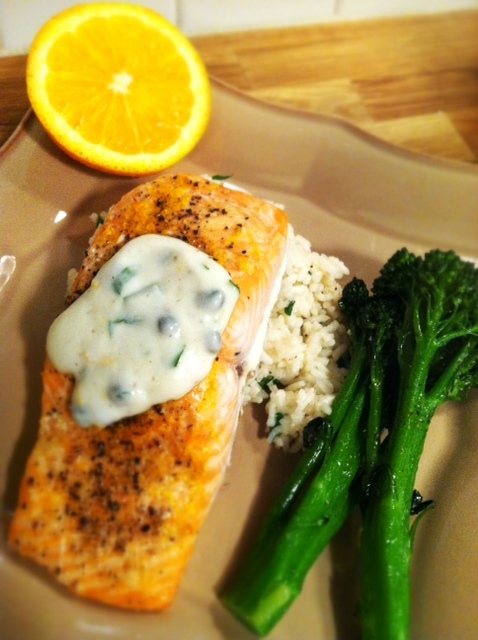 If you are in the mood for a springy dish, you should try this Roasted Salmon with Yogurt Sauce. The sauce and salmon are made with an orange and while orange is technically a winter flavor, this meal was light and flavorful and perfect for spring. The base of the sauce is yogurt! So it is super healthy and you don’t have to feel bad for having a little extra. 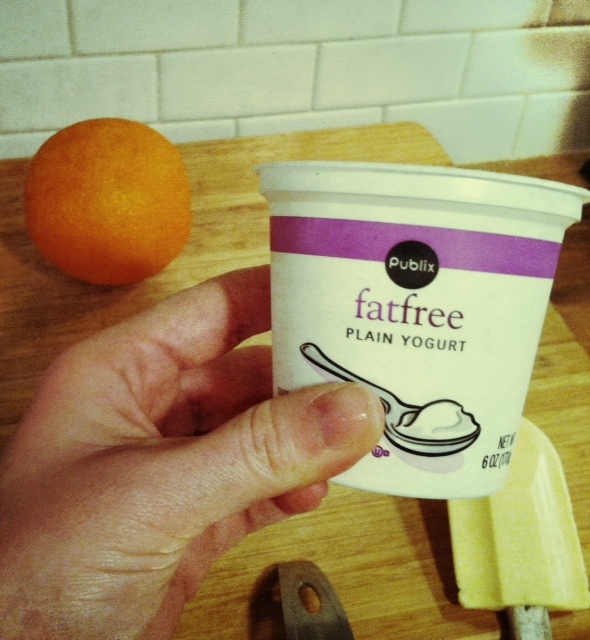 I tried to find full fat yogurt but fat free was all my store had. Just mix all the ingredients for the sauce together and set aside while you get the salmon ready. The seasonings for the salmon rub are really simple. They are just olive oil, salt pepper and orange peel. Meanwhile, I sauteed some brocollini with shallots and garlic. 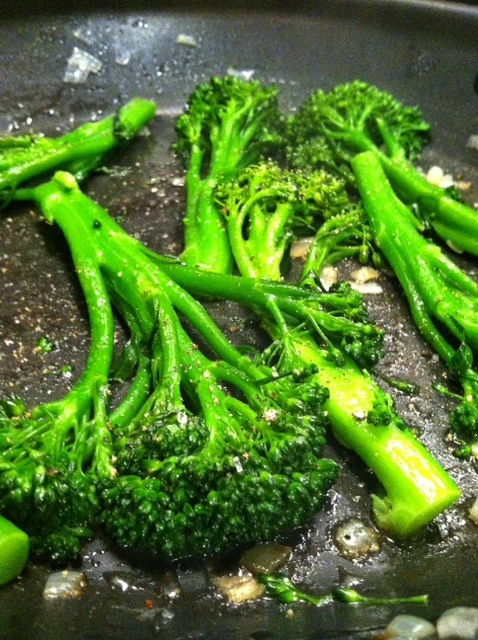 If you have never had broccolini you should look for it. It is sort of a combination of broccoli and asparagus and I love the texture. 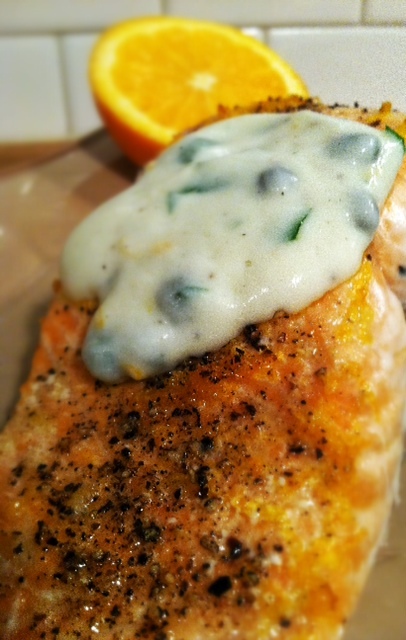 Top the roasted salmon with the orange caper sauce. Lightly oil a glass baking dish. 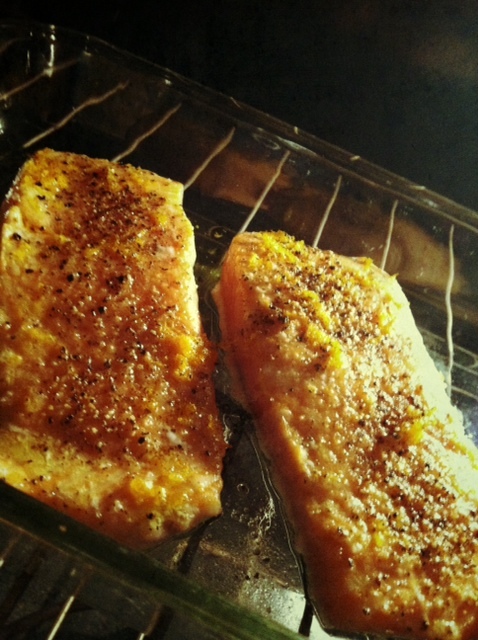 Arrange the salmon skin side down on the baking dish, drizzle with 1 Tbs. of the olive oil, and sprinkle with 1 tsp. 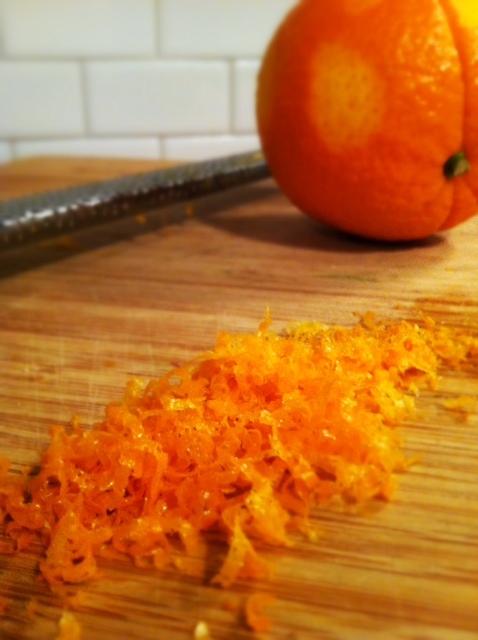 of the orange zest, the salt, and a few grinds of black pepper. Gently rub the seasonings into the fish. Let sit at room temperature while the oven heats. 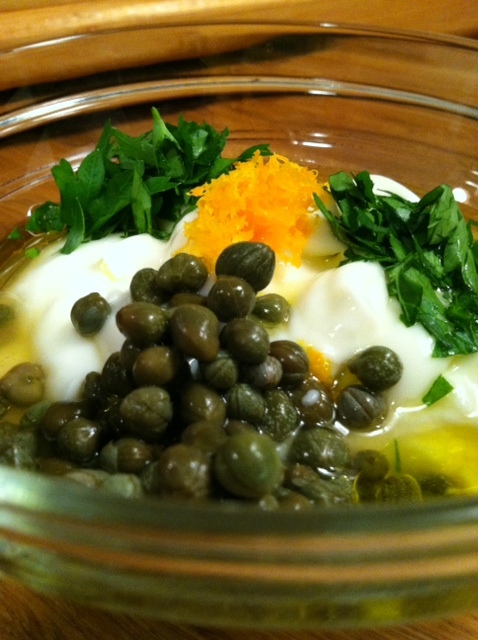 Combine the yogurt in a small bowl with the remaining tablespoon of olive oil, 1/2 tsp. orange zest, and the parsley, capers, and orange juice. Stir to combine. Season to taste with salt and black pepper. Set aside. Roast the salmon until just cooked through, 10 to 15 minutes depending on how you like yours cooked. Serve immediately, drizzled with the yogurt sauce. I can’t wait to make this! I might make it like . . . tonight. MMMMMMMM.